Whip up a batch of frozen pops as a warm-weather treat. 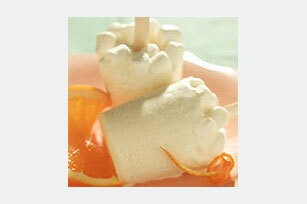 Flavoured with marshmallow and orange juice, these homemade pops are fun and easy to make. Beat marshmallow creme and juice in large bowl with mixer until well blended. Whisk in Cool Whip. Stir in marshmallows. Spoon into 8 paper or plastic cups. Insert wooden pop stick into centre of each cup. Freeze 3 hours or until firm. Remove from cups before serving.